We all love good food, but some favorite dishes sometimes start being avoided if heartburn becomes an issue. 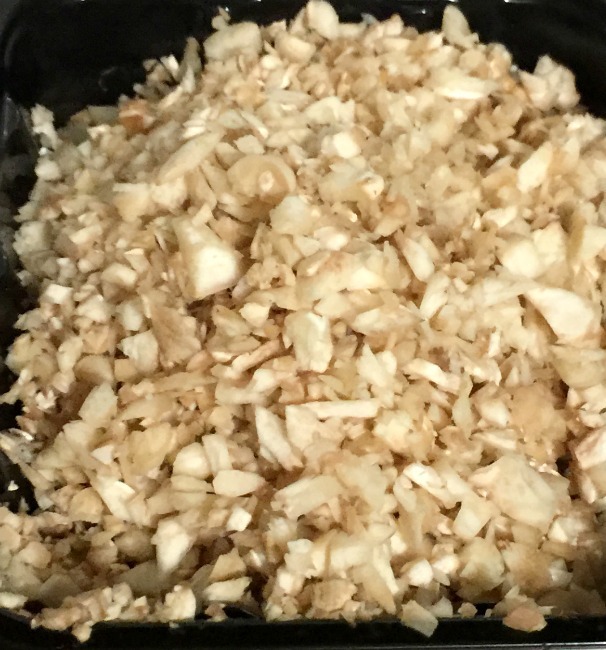 We’re sharing one of our favorite recipes today, AND a heartburn solution to help you enjoy it! My dad was known for his cooking skills. He made chili every winter in a 5 gallon pot, and we’d gladly eat it all. His steaks were legendary and his recipe for stuffed mushrooms made even people who claimed to hate mushrooms ask for a few more on their plate. He always kept the mushroom recipe a secret, he wanted to be the only one making them for everyone. But one year, he invited a family friend over and let her take notes while he cooked the famous mushrooms. He didn’t have an official recipe, he just cooked and somehow everything always turned out delicious. As our friend scribbled out notes, none of us realized this would be the last year he made mushrooms for us before he passed away, and those notes she took would end up being invaluable to us! I love that I still have this recipe and tradition of the famous stuff mushrooms to carry on with my own family. You’ll want to start on the mushroom stuffing the night before you want to eat the mushrooms. 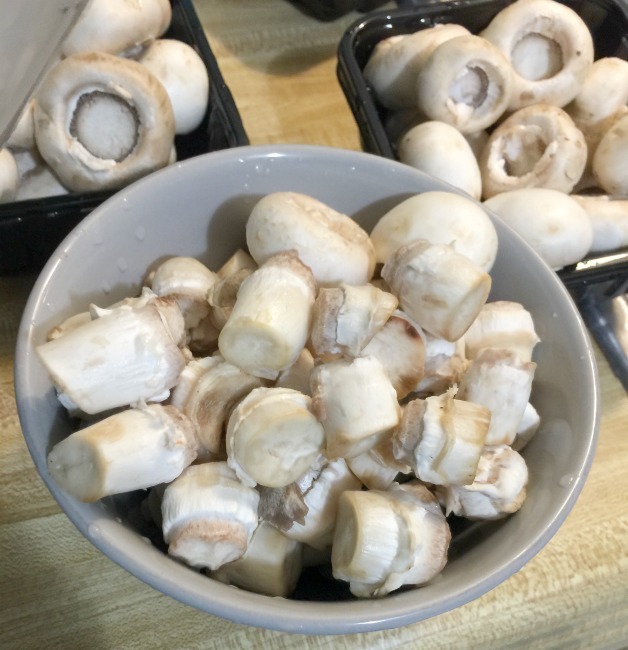 Clean mushrooms, take out the stems and chop stems finely. If you have a food processor, that will make this process a lot faster/easier. Melt half a stick of butter in a large saucepan. Add the chopped stems and chopped onions to the pan and sauté. While the mushrooms and onions are cooking, mince 3 cloves of garlic and add to the pan. Add a dash of onion powder and paprika. When the mushrooms are soft and the onions are clear, separate the sautéed mix from the butter and set both aside. Into the pan put one tablespoon of butter and sautéd mushroom mixture. Add cream cheese, Worcestershire sauce and dressing and stir until the cheese melts and mixture is sizzling. You’ll also want to refrigerate the butter you used when sautéing and the mushroom caps. Heat the mushroom stuffing mixture on the stove. In another pan, melt the butter from the old sauté mix and 1.5 more sticks of butter. 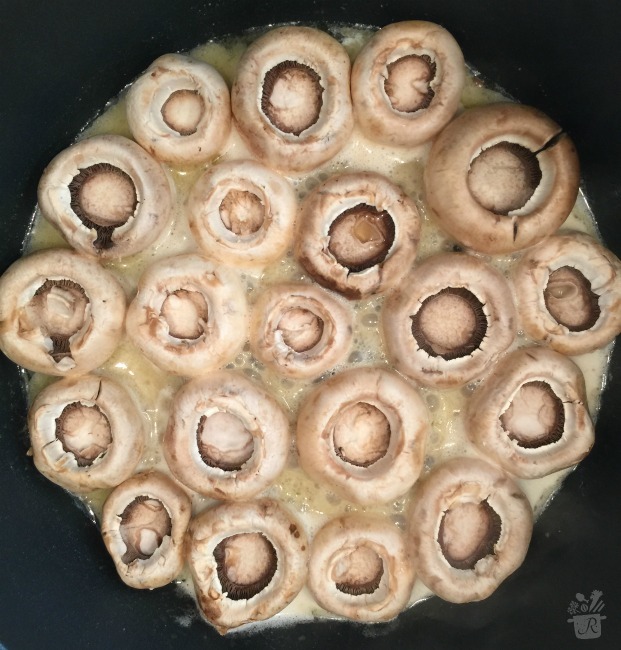 Add a good amount of garlic powder to the melted butter and and sauté the mushroom heads on both sides until browned and soft. Let sit for 4-5 minutes and they will fill with water. Fill the mushroom heads with the warmed stuffing. 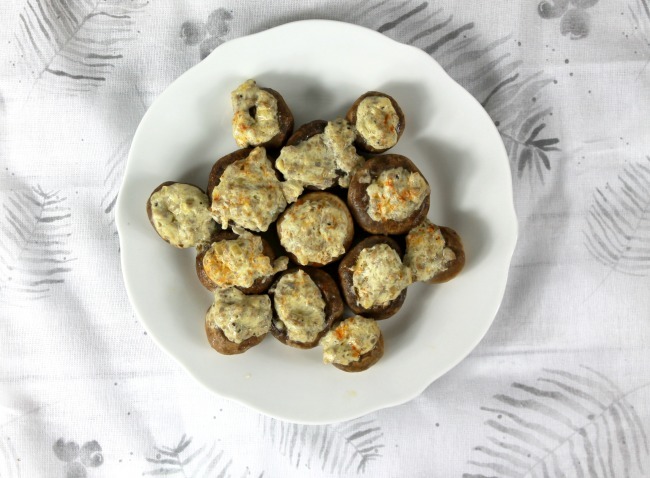 Put the stuffed mushrooms on a pie plate, sprinkle lightly with paprika and broil for 45 seconds. These are a holiday MUST at our house! If you have holiday musts like ours that can cause heartburn, while you are at the store picking up recipe ingredients, make sure you swing by Walgreens to pick up Nexium® 24HR Capsules 42ct. 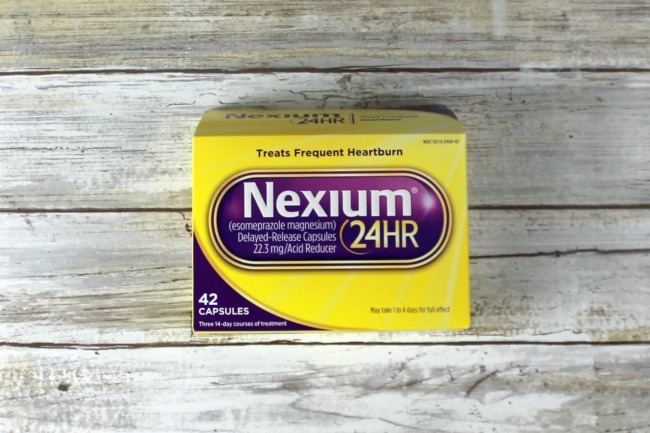 Nexium® 24HR is for the treatment of frequent heartburn, it can take 1 to 4 days for it to take affect, so if you frequently suffer from heartburn it can be a good idea to pick this up before the holidays so you can enjoy your favorite food traditions without worrying about heartburn. Do you have favorite family recipes? Share with us some of your favorites in the comments, we’d love to hear about them. 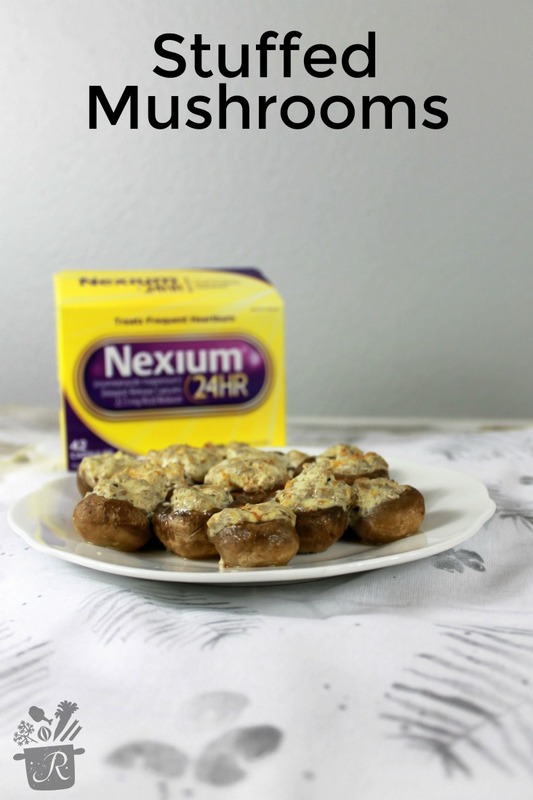 Don’t let heartburn keep you from your favorites, be sure to pick up Nexium® 24HR next time you are in Walgreens! See more of our favorite snacks here.